I am a 50 year old music teacher who likes swimming, cycling, playing guitar and film. I have played at various functions in a band and as a soloist. I teach in schools for Surrey Arts and privately at home. I am fully police checked. I am married and live in Ewell and have two grown up children. I have been teaching guitar full time for 15 years. 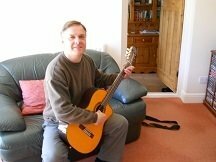 Peripatetic Classical and electric guitar tutor. Teaching traditional notation, tab and guitar technique. examinations up to grade 8 standard. I mostly start students off with a book called the Guitarist's Way and introduce reading notation from day one. Pupils gradually work through the book, learning the 1st position, (1st 4 frets on all 6 strings), then the higher fingerboard positions. After book 2, I encourage work towards grade exams. I also teach rhythm and lead electric guitar through popular songs.